These hackamore bits are very useful when a horse's mouth is sore, or if the demands of your sport require you to pull harder than is appropriate with a mouthpiece bit. The thick, braided leather nose will command attention. The "mechanical" hackamore, is a modern "high-tech" hybrid of the original California hackamores. They are very useful when a horse's mouth is sore, or if the demands of your sport require you to pull harder than is appropriate with a mouthpiece bit. The thick, braided leather nose will command attention. 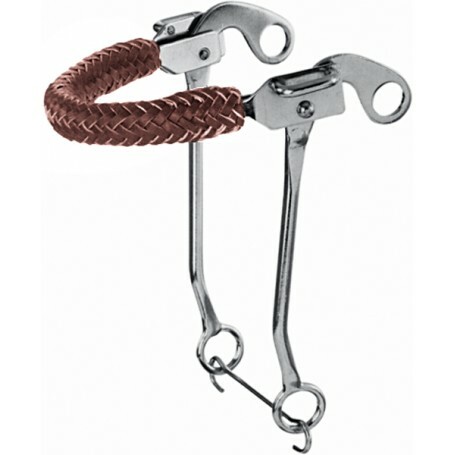 Features: 9" horse chromed steel shanks with braided leather covered chain noseband.